THIS POST IS PART OF ALL CLAD’S #12DaysofAllClad GIVEAWAY. 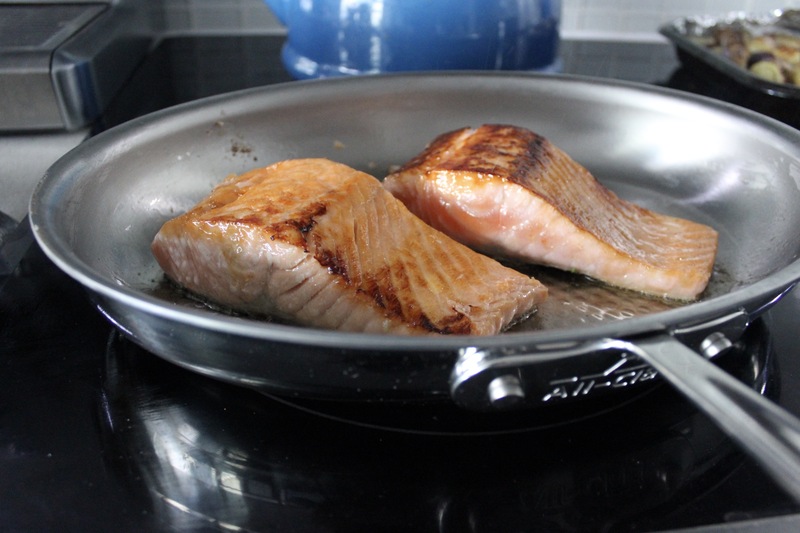 CHECK OUT THIS LINK TO ENTER A CONTEST TO WIN AN ALL-CLAD D3 ARMOR FISH PAN (VALUED AT $300). It’s the most wonderful time of the year! Does anyone else feel like the holidays is the best time to be a foodie? It gives you an excuse to show off your cooking skills, share a good meal with friends and family, and give gifts to those you appreciate (see the #AllCladGiveaway on my IG feed!). I started cooking when I was 18 years old. Now that I have a decade under my belt, I’ve decided it is time to upgrade my cooking gear. My goal for the next decade of my home-cooking career is to build up a collection of quality cookware. *The pan is part of the D3 Armor Cookware line and is made with an innovative easy-release bonded matrix that helps reduce sticking. This is key for cooking fish because of how delicate it is. 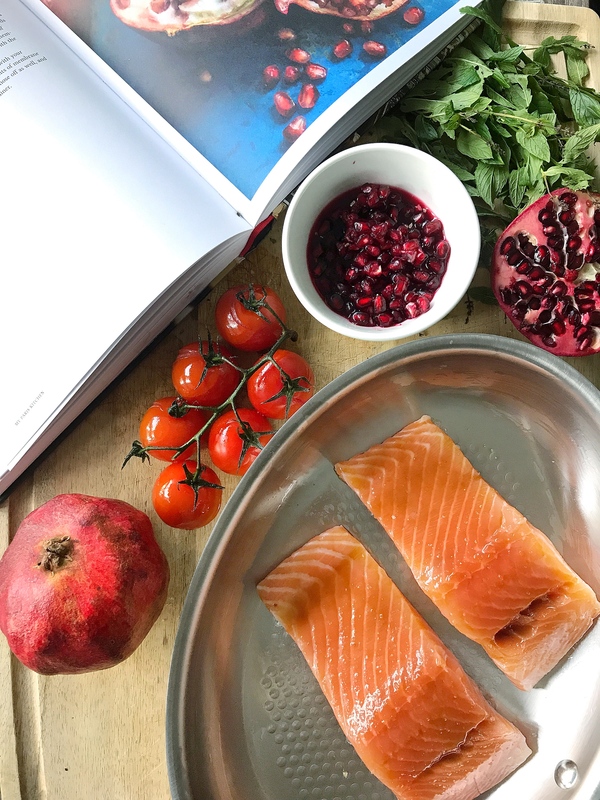 *The pan’s riveted dimples on its stainless-steel cooking surface provides natural stick resistance, making it ideal for searing, browning and pan frying. *The three-layers of bonded metal ensure even heating so that your fish cooks to perfection. 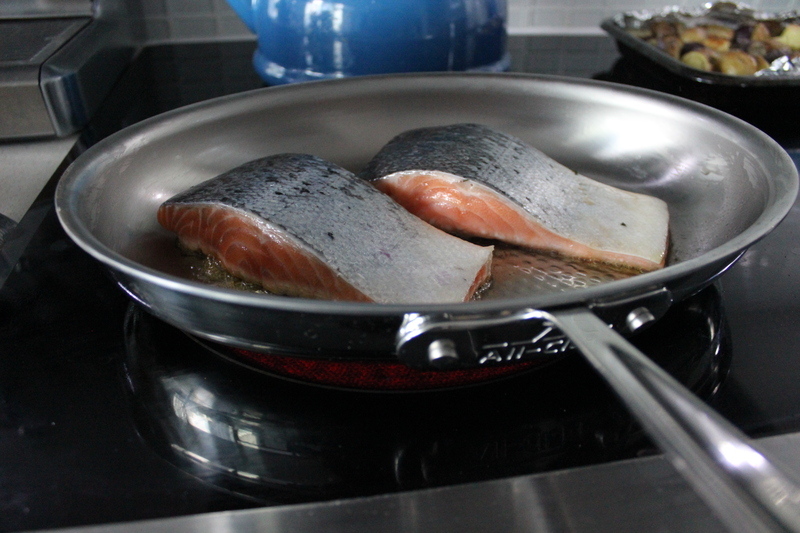 *Although the pan is made for fish, its unique oval shape makes it great for cooking steak, shrimp, scallops and omelettes. 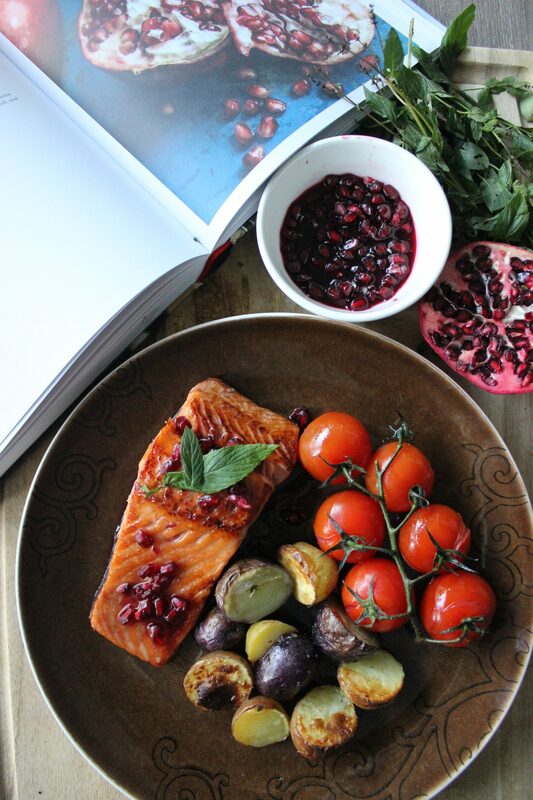 For this recipe, I decided to use lots of pomegranate because of its deep ruby colour. It’s a stunning winter fruit. 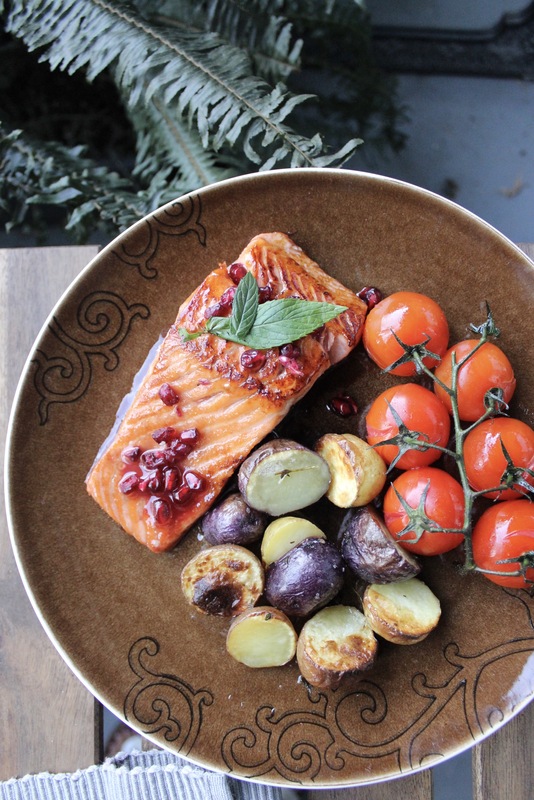 And while fish never seems to be highlighted on holiday menus, I maintain that it makes for a great alternative to the meats that are often served. Try out this recipe to impress your family and friends this holiday season – it won’t disappoint! Prepare the pomegranate glaze in advance. Bring the pomegranate juice, sugar, and mustard to a boil, then reduce to a simmer. Allow the liquid to reduce in half; it will take about an hour. Preheat oven to 450. Toss your potatoes in olive oil, salt, and herbs. Roast for 20 min, turning the broiler on for the last couple minutes. 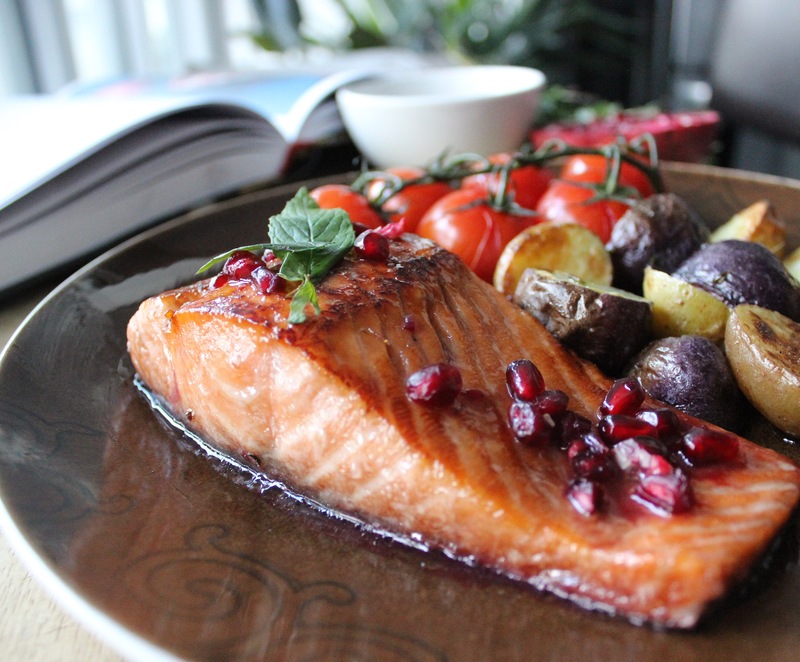 Remove from oven and start your salmon. Bring your oven down to 400. Rub your salmon all over with a mixture of the cornstarch, salt, and brown sugar. Add oil to the pan and turn on med-high heat. NOTE: The pan will heat fast so you only have to wait a few minutes! 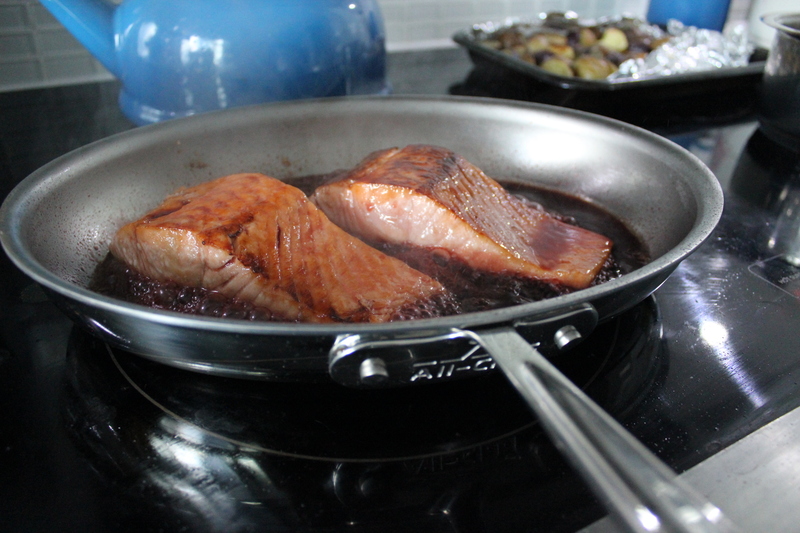 Sear the salmon skin-side up first for about 3-4 min or until half the flesh turns opaque. Then, flip skin side down and sear for another 3-4 min. The flesh should be nicely browned. Add the pomegranate glaze to the pan and let it bubble for a few minutes. Then, pop your pan into the oven and bake for about 8 min. Disclaimer: This post was created in collaboration with All-Clad as part of their #AllCladGiveaway. As always, views, opinions and recipe development are my own. 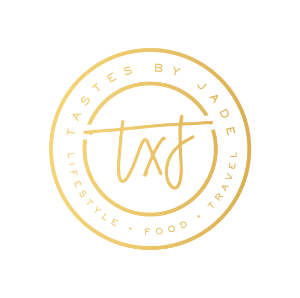 Sarah Jade is a Toronto-based lifestyle blogger who is passionate about all things aesthetically pleasing, wonderful and delicious! 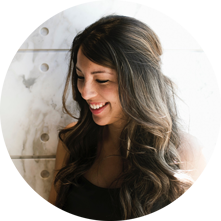 You can typically find her lounging in a coffee shop with friends, discovering a new city on her bucket list, or making homemade ice cream with her husband David. They are expecting their first child September 2017.